Andy Kim, 36, is a Rhodes scholar, a counterterrorism expert and a former director for Iraq issues on the National Security Council. In short, his résumé is campaign gold as he competes in one of the closest House races this year. New Jersey’s 3rd Congressional District is one of 30 rated a toss-up this year by the Cook Political Report. It went for Barack Obama twice before swinging to Donald Trump in 2016. Democrats outnumber Republicans by more than 12,000 registered voters. The Kim campaign’s first TV ad highlights his work as “a national security officer for Republican and Democratic presidents.” That bipartisan sheen surely helps in the closely divided congressional district of GOP Rep. Tom MacArthur, who courted controversy last year by working with President Trump on an unsuccessful bid to repeal and replace the Affordable Care Act. It is beyond dispute that Kim worked in sensitive and high-ranking national security roles in Obama’s administration. But his résumé is conspicuously light on national security work while Republicans held the White House. Let’s take a look. Kim joined the Obama administration in September 2009 as an Iraq expert at the State Department. In 2011, he spent five months in Kabul in a civilian role advising two commanders of U.S. forces in Afghanistan, first Gen. David H. Petraeus and then Gen. John Allen. Kim was director for Iraq issues at the Pentagon for five months in 2013 and then was Iraq director on Obama’s National Security Council for two years until leaving the administration in August 2015. “At first I was an antiwar protester in 2003, but then once our country moved to the war, I was really trying to think through, ‘How can we as a country get through this? How can we do this in the way that is most responsible?’” Kim told this reporter in 2017, when he announced he was exploring a run. Kim also served as Obama’s designated expert on the Islamic State terrorist group. When Islamic State forces threatened tens of thousands of people in the Sinjar Mountains in the summer of 2013, Kim was part of the team coordinating airstrikes and humanitarian relief. Kim is writing a book about the “U.S. government’s war against ISIS and how governments can improve efforts to counter global terrorist threats,” according to his résumé. It's clear that Kim held a string of sensitive and high-profile national security roles in the Obama administration, helping to steer one of the longest and costliest wars in U.S. history. And we don’t question his expertise. Aside from his experience under Obama, Kim’s doctoral research at Oxford University focused on U.S. national security, Middle East politics and history, Iraq, transnational terrorism threats, crisis response and post-conflict stabilization. Kim’s page on LinkedIn says he worked “less than a year” in 2005 as a conflict management specialist at the U.S. Agency for International Development (USAID). Kim’s résumé, which his campaign provided upon request, provides more details. At USAID, Kim held an entry-level job that lasted five months, from February to July 2005. It was his first full-time job after college, according to his résumé. After graduating from the University of Chicago in 2004, Kim spent four months that year as an intern at USAID on a Truman scholarship. After a break, Kim returned the next year and became a conflict management specialist in USAID’s Africa Bureau for five months, before decamping to Oxford. Kim was paid at a GS-9 level at USAID, his campaign said, which at the time meant a salary of $37,390. Picture it this way: A civilian at the GS-9 rank is the equivalent of a second lieutenant in the Army, the entry-level position for commissioned officers. Former colleagues said Kim’s work was nonetheless meaningful and firmly tied to U.S. national security. His campaign provided statements from two former USAID officials. “The work that Andy Kim and other USAID officers working as conflict management specialists have played is critically important to implementing national security policy, including efforts to counter the growth of terrorist cells in fragile and failed states and conflict areas in Africa,” said Corinne Graff, a former USAID deputy assistant administrator who worked with Kim on Obama’s National Security Council. Democrats advising Kim emphasized that the ad was technically accurate despite the short amount of time Kim spent in the Bush administration and his lack of seniority. MacArthur strategist Chris Russell said Kim should take down the ad. “Andy Kim grossly embellished his résumé at USAID in a deliberate attempt to mislead voters about his background,” Russell said. We don’t question Kim’s expertise on national security, but his ad stretches his résumé to elastic extremes by claiming he was a national security officer for a Republican president. Kim’s work under Bush simply pales in comparison to his pivotal role in the Obama administration. In any event, considering that the USAID job was an entry-level position, that Kim held it for only five months in 2005, that GS-9 is low on the totem pole, and that Bush did not at the time place much focus on Africa in his national security strategy, it seems like a classic case of résumé puffery. Consider that this line in the ad was part of a bipartisan montage featuring Bush, Obama and the Oval Office. Our conclusion is tempered by the fact that Sudan was one of Bush’s priorities and that former colleagues of Kim say he did meaningful work on bona fide national security issues, such as terrorism and genocide, during those five months. Kim has plenty of experience to pitch to voters without exaggerating his first job. 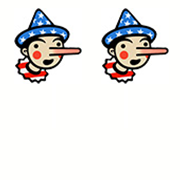 We give him Two Pinocchios.